There are many factors to take into consideration when thinking about the best life-insurance coverage for you and your family. We generally like to look at your total financial landscape, taking into consideration debts and assets, age, profession, earning potential and family responsibilities. Something else to consider is whether term or permanent, also called whole or universal, life insurance is the better option for you. There are benefits to each. Term life insurance is generally for a specific period of time; it’s designed for those where someone only needs coverage for a particular period of time or those who prefer to purchase at a lower premium, with the understanding that the policy will end after a finite period of time. It’s available in 10, 20 and 30-year terms; the longer terms have higher premiums and longer death benefits. For a 10-year term life insurance policy, you would receive a full 120 months of coverage. If you die during this period, your beneficiaries will receive death benefits–while there are exceptions, most policies will cover death benefits to your family if the cause of death is an accident or natural causes. Withholding important medical information that would have affected the underwriting of the application will likely cause a problem if a claim is filed. When your policy comes to the end of the term, it simply expires. If you wish to extend the coverage, you must purchase a new policy, but this will be at current market rates and you’ll be ten or more years older, so the premiums will likely be significantly higher. Term life insurance is most often used for a specific purpose–to pay off debts, for instance, after your death. Keep in mind also that term policies have no cash value component. With a permanent policy, you’re building up equity; you can borrow against the accumulated value or even cancel your policy. Note that there are loan provisions and surrender charges if you cancel your policy. A term policy has no provision for the cash you’ve invested in your policy. Term may be the policy of choice when protection needs are high for a period of time, such as when your family is growing. 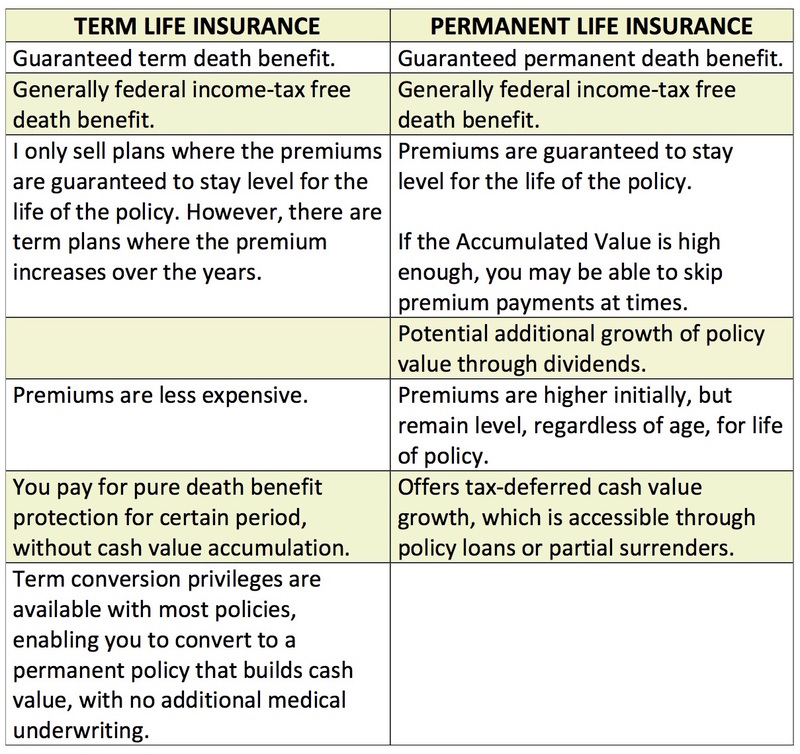 Term life insurance can also be an effective way to supplement permanent insurance during high-need years. A good example would be if you had a spouse and small children and were starting your own business—this would be a situation where your financial demands might be outpacing income, yet you’d want to protect your family if something happened to you. Permanent life insurance is the more robust solution; it was designed to provide life insurance coverage plus other “living benefits,” including guaranteed cash value accumulation as long as premiums are paid, potential eligibility to earn dividends, and the access to cash value via loans and partial surrenders (removal of a portion of the original cash balance of an insurance policy). Permanent life provides life-long insurance protection. Once you have been approved for coverage, your policy can’t be canceled by the carrier as long as premiums are paid when due. Regardless of your health, the insurance will remain in force. Permanent life builds guaranteed cash value, provided premiums are paid. This amount can be used in the future for any purpose via a policy loan. For example, you can borrow cash value for a down payment on a home, to help pay for your children’s education, supplement retirement income, or help with paying for long-term care expenses–even if you haven’t purchased a hybrid plan. Do you have questions about whether permanent or term life insurance is the right choice for you at this point in your life? Contact Carly Barker: 510.342.2670, carly@cjbins.com, CJB Insurance Services.